Product prices and availability are accurate as of 2019-04-12 06:02:12 EDT and are subject to change. Any price and availability information displayed on http://www.amazon.com/ at the time of purchase will apply to the purchase of this product. 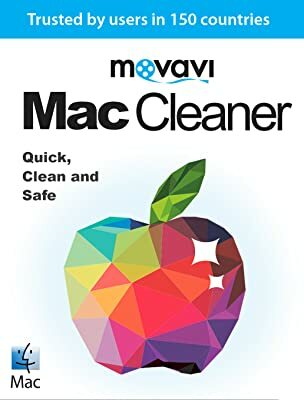 Movavi Mac Cleaner is a simple and effective program that will make your Mac run as fast as it did when it was brand new. 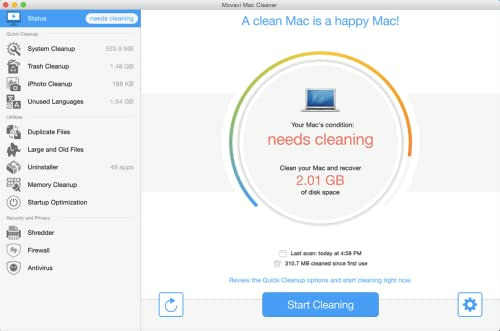 Mac Cleaner will scan the system from top to bottom so you can delete all the junk files with a single click. The program will also guide you through removing large and old files, give your Mac an instant performance boost, and protect it from Internet threats. 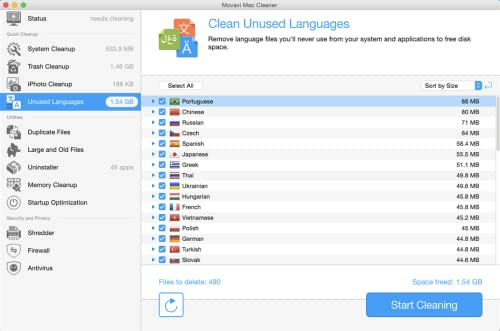 Mac Cleaner is the perfect tool for finding and removing unnecessary files so you can reclaim disk space. 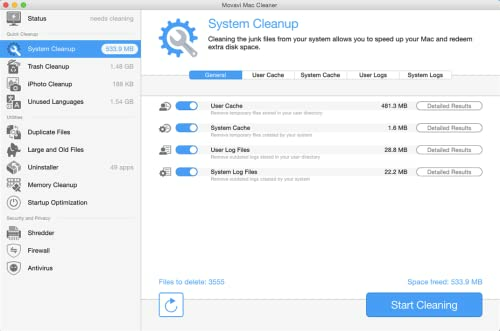 Use the Autoclean function to delete all the junk files in one click, safely remove space-wasting caches and logs, find and delete duplicate files that clutter up your hard drive. The Uninstaller will help you completely remove applications from your computer, including the pre-installed OS X apps that can’t be deleted in the normal way. If your Mac is running slow, try clearing out the RAM from unused data – this will significantly speed up your computer. Startup Optimization will help you manage the applications that automatically open when you log in, remove unwanted items, and improve your Mac’s startup performance. Plus, Movavi Mac Cleaner includes reliable protection for your Mac from different kinds of Internet threats. You can adjust the firewall settings to control inbound traffic and scan folders on your hard drive for malware; infected files can be repaired or deleted. The Shredder will help you to completely remove files containing personal data to protect your privacy. 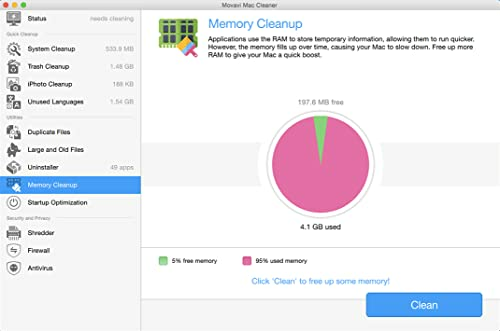 Movavi Mac Cleaner is the secret to a fast and healthy Mac. Try it and your computer will always be in great shape! Please note that you will need to activate the software using the Activate Software dialog box in the application menu with the license key provided to you by Amazon after you complete the purchase. Additional Requirements: Administrative permissions are required for installation.